I've been reading a lot of posts on here and other forums about suspension. I've owned my van for over 2 years now and suspension was near the top of the list of things to do. So here goes! Ever since owning the van its been a very harsh ride, I feel every little bump / hole in the road. Everything is amplified like I've hit a huge pothole every time. Even to the point that the bang will sometimes feel like the screens going to crack! I have Vito 17" steels with standard tyres and I know the van has been lowered but I dont know by how much. Here lies my quandary. My question is where do I start? 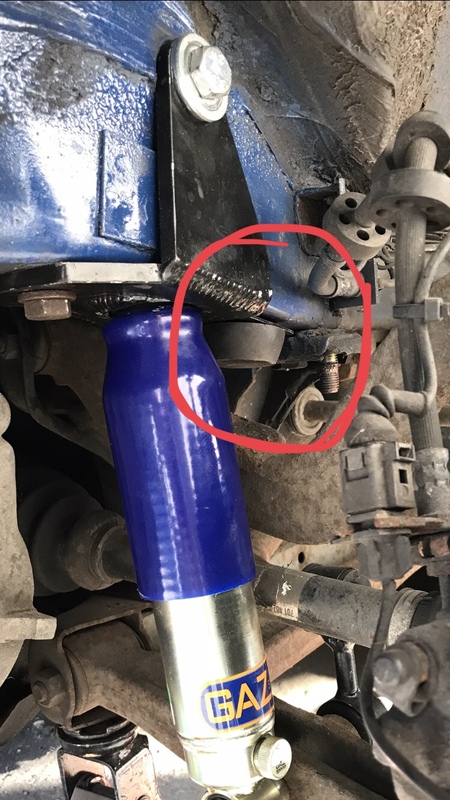 - do I replace front shocks and Shocks and springs on rear and guesss the spring (if its 40mm / 60mm) or should I look at those adjustable ones? However the whole thing will depend on the cost (as always! I also have a service including cambelt/waterpump etc to get done this spring). I've seen entire kits as cheap as £135 on ebay but I guess its a "you get what you pay for scenario" there?! Could it be I can adjust something to make the ride less harsh for now? Any help or advice regarding this would be really appreciated. Sounds like your on your front bumpstops mate.Get a torch and with the van on it’s wheels.Looki n behind front wheels.You should see the shock and just in front the swing arm and a cone looking black rubber bumpstop.My guess is that the swing arm is to close to the bumpstop.You need about a 30mm gap.Jack it up and with the wheel off,get a junior hacksaw on the bumpstop and cut horizontally across.Take 15mm off each side and go for a drive.Reckon that should sought it. I think I understand most of that! So am I just shaving off 15mm of the rubber cone bumpstop on each side? I'll take a look over the weekend. Yep.do this first.It’s cheap and easy and you won’t harm anything in the process. This black rubber bit mate.. Thanks for the photo. So am I right in saying that a previous owner has adjusted torsion bars to bring front down? From reading up as far as I found thus appears to be the way it's lowered at the front? If this is the case can I adjust bars to bring it up a bit? Then on the rear I'll look at replacing the springs. I agree with Roy, might it be cheapest for the time being to get it on a level surface and firstly measure the ride height and make some adjustments? Not disagreeing with other advice but your ride is probably different to my townie drive, we're all in different locations and use our vans in different ways with different loads. Find your ride height for the road and conditions you drive. Adjust the front torsion bars with a 27mm spanner , there plenty of advice about how to do it here and elsewhere. If you need to adjust the rears a little, check your rear springs are they fitted with the rubber spacers/underlay top and bottom of the springs, those could give you 5-10mm. Watching this with interest as I'm in the same boat. Ross mate, where did you get your new front sus mounting plate? Did you make it up yourself?